The Poster Sessions will take place from Thursday to Saturday immediately after the lunch break and without competition from other simultaneous events. Each author will outline his or her findings in the context of a three-minute presentation. The subsequent discussion will be facilitated by two moderators. 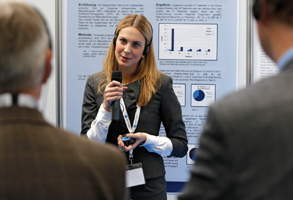 The primary author must be present at the Poster Session during which his or her poster is discussed. For this purpose, the authors must join their respective poster groups at the announced time. Posters can be presented in German or English. To enjoy an undisturbed Poster Session, we are offering headsets with receivers. The poster presentation of the respective author will be transmitted via radio frequency. At several stations in the poster foyer the necessary equipment will be handed out free of charge by our staff. Please arrive in good time prior to the start of the Poster Session in the Foyer Estrel. The equipment must be returned to our staff at the end of the Poster Session to the designated stations. The Prorgramm is published probably in June, 2015.